We like your blog, can we use it in our London Lite newspaper (free evening newspaper for London) was the question in the email I got. Sure I said, but let me know what you want to print, because there are things that I don’t want to have printed (including my name). Could you tell us in short what your blog is about? is what I send them. They chose a post I quite like. It got Bill in it, I got the film mentioned, and the best thing: the Cafe (including the address) is in it. A lot. All good. And who are those friends I have never ever written about, because I don’t blog about people I know out of a principle? Anyway – Good Evening London. Now that you’re famous, we’re all your friends. I don’t want to be famous, I want the Cafe to be famous. And about those free newspapers, I was on Piccadilly Circus a few days ago, and it was nearly covered by those newspapers, because people now use them to sit on. What a mess! I wonder how long this is going to last. It’s not only London Lite’s fault, The Londonpaper is to blame too. And the lack of paperbins in London. Congrats. This is really cool. 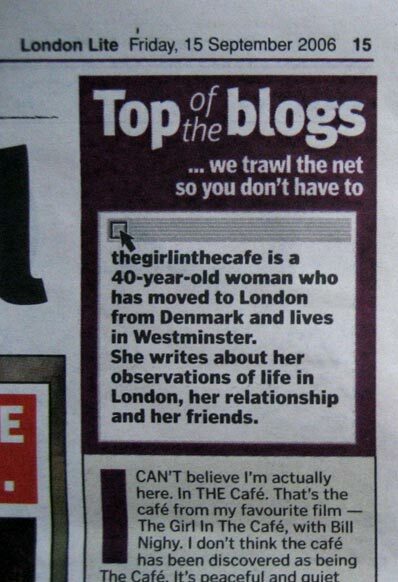 Be great if the cafe got more publicity and stayed open though.